Today I bring you a guest blog post written by Paula Carleton Evans. Paula is currently working on a book about about the Chilean Thoroughbred Huaso nee Faithful, an ex-racer who jumped a wall higher than eight feet back in 1949 and still holds a world record for that feat. The story is timely, as yesterday marked the 65th anniversary of Faithful's legendary jump. 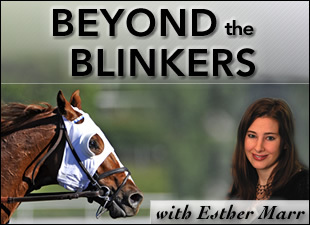 I hope you enjoy Paula's historic account of this incredible OTTB! The oldest world record in sport reached a phenomenal milestone yesterday, 65 years after it was set by a Thoroughbred whose name may as well have been Pegasus, and the sport, aviation. 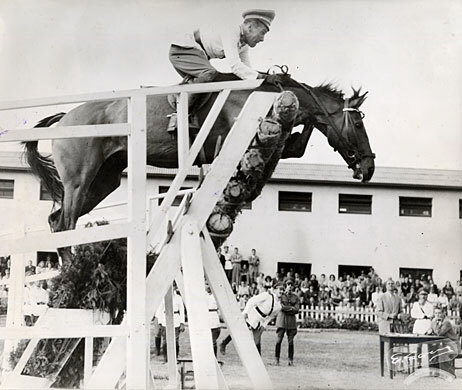 On February 5, 1949, Huaso nee Faithful, ridden by Chilean cavalry Captain Alberto Larraguibel Morales, jumped a wall 8 feet and 1 inch (2.47 meters) high. No horse and rider team has yet to match or best the achievement since. Outside of Chile, where it is duly celebrated, this landmark of equine and human athleticism is largely unknown, barely registering even among competitive puissance riders. No mirrors or pulleys were involved in this spectacular feat, held as it was to the exacting protocols of a world record which dictated all circumstantial particulars such as where, when, and the number of allowable attempts (three). The only non-designated element of assistance received by horse and rider was in the form of outrageous belief in their combined abilities, as though the horse's original name of Faithfull had become intrinsic to its being. This makes the world record set 65 years ago in Vina del Mar, Chile a record not only of the highest equestrian jump, but also of the greatest documented instance of faith between human and horse. But getting to that point of perfection took many mistakes, possibly a world record number. Faithful had been bred for the racetrack, a Thoroughbred of top South American lineage that traced back to Britain and the original sires. For six years, Faithful unflaggingly proved his lack of speed, never once entering the winner's circle. Add to this lusterless career a reputedly dismal set of ground manners, and one concludes this horse was lucky to have lived in a time and place where Thoroughbreds were a precious scarcity. Retired finally from the track, Faithful was acquired by the military for training in dressage. These were the days when parades served the powerful PR function of demonstrating a nation's military prowess and rousing support from the public. In 1942, when Faithful was enlisted in this effort, a sharply suited cavalry could still suggest a country's glory. But for Faithful, dressage would be another exercise in ignominy. One day while training in a ring, Faithful balked at a request, plunging rebelliously backward into a wall from which a piece of metal (some sources claim a rake) protruded. Faithful's flank was severely gouged and he almost bled to death. But as his odd luck would have it, a vet of happened to be at the barn, and the devastating injury was swiftly tended, saving the ornery horse's life. Such was the success of the treatment that Faithful made a full recovery with every ability restored but, crucially, one: the exacting muscular control necessary to execute the precise action essential to dressage. This did not however end the cavalry's interest in Faithful. Upon recovery, he was put into training for stadium jumping, a popular event again useful to display military know-how. Training began, with Faithful discarding his dressage technique but, notably, retaining his contempt for rules. One day, while being long whipped over fences in an outdoor ring, the rider-less Faithfull tired of the three foot jumps, and leapt instead over the enclosure's external six foot wall, exerting himself doubly rather than comply. It was at this moment that the hand of fate showed itself, for just as Faithful was staging his flying protest, and making the case that his talents were misidentified, Captain Alberto Larraguibel Morales was driving up the stable's entry on his singular mission to find a high jump prospect, a horse with the rare ability to clear fences of heart-stopping height. And so it was that naughtiness changed the course of equine history, setting in motion a process which would culminate, 65 years ago yesterday, in a then-renamed horse defying gravity in a way unmatched by any since. With his intractable disposition and elegant rider aloft, Huaso--thus named to reflect his Chilean origins as the term is exclusive to his country--spent the next seven years being uncharacteristically cooperative and uncommonly sensational at a sport that has never since seen his like and most likely never will. Click here to view a video of Faithful's jump.